Active ingredient: 1000 mg Micronized Natural Progesterone per 2oz. Cycle Balance Progesterone Cream is as gentle as washing your face but with a better absorption of Micronized Natural Progesterone USP and the perfect amount every time. 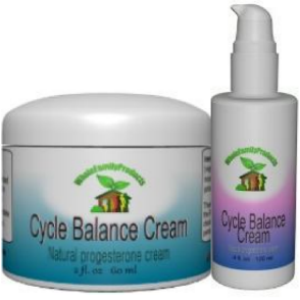 Enter Cycle Balance Natural Progesterone Cream. By using a cold-pressed process the cream is never heated beyond the acceptable temperature for maintaining the natural integrity. Cycle Balance Natural Progesterone Cream® is a non comedogenic (meaning does not cause a reaction) cold processed cream (meaning that it is not heated above a temperature which would affect its integrity) that is free of isopropyl palmitates, glycerol stearate, octyl palmitate, stearic acid, DEA, triethanolarmine (TEA), dimethicone, cyclomethicone, PEG, alcohols, emulsifying wax, dyes, colors or mineral oil. The Lanol (vegetable ester) is blended with Aloe Vera and a dermal delivery system. Lanol has a reputation as one of the finest cosmetic moisturizers and reputed to maintain youthful appearance; Aloe Vera is world renowned for its capabilities to hydrate the skin. Visit Our Catalog to purchase this product and other great hormonal and daily health products. Purchase at retail, wholesale or become part of our affiliate network. OR check out our AFFILIATE - WHOLESALE options.